With the peak of summer heat upon us in Fort Collins, our landscaping professionals have been busy helping our residential and commercial customers maintain a healthy lawn this summer. While it’s always best to hire a professional landscaping company for your summer landscape maintenance needs, there are a few tips you can follow to help your lawn combat the extreme heat of summer. In part two of this series, we will go over the remaining four tips and tricks to maintaining a healthy lawn in extreme summer heat. If your lawn is too dry, their ability to recover becomes limited, and mowing can damage your grass even more. If there is a drought, and your grass is under stress, avoid mowing the lawn until a rainfall or natural irrigation occurs. 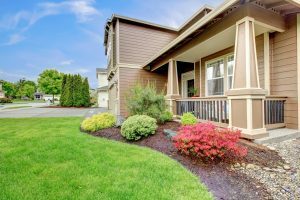 While it’s not uncommon to see homeowners bag up and throw away their grass clippings, they can actually be beneficial to reuse. With the help of a mulching mower, you can re release your grass clippings as fertilizer for the lawn. Always be sure to aim the spread of clippings away from streets, bodies of water, and storm drains to reduce pollution. During hot summer months, avoid fertilizing your lawn. While homeowners and inexperienced landscape companies might think fertilizing in high temperatures is useful, fertilizing can stimulate your grass’ growth and consume much-needed energy, further stressing your lawn. When it comes to watering your lawn in the summer, try to water it between 6AM and 10AM. This is the most efficient time to water your lawn, as less moisture is lost to evaporation, and your lawn will have plenty of time to dry off before evening. Watering at night can provide your lawn with too much moisture, inviting disease and other stressors.